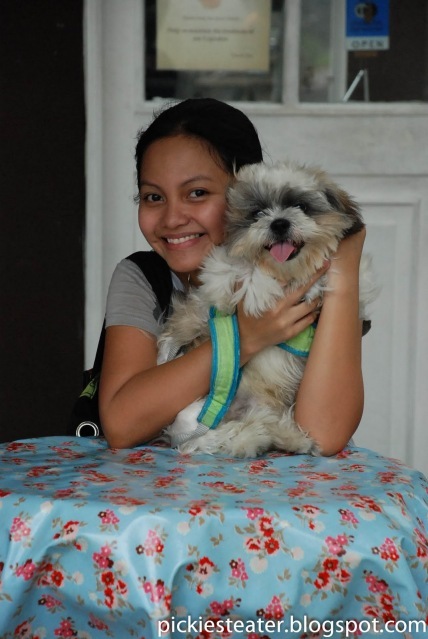 Three of the sweetest things in my life.. My Wife, My dog, and my cupcakes.. I've got a thing for cupcakes. I'm not ashamed to admit it. 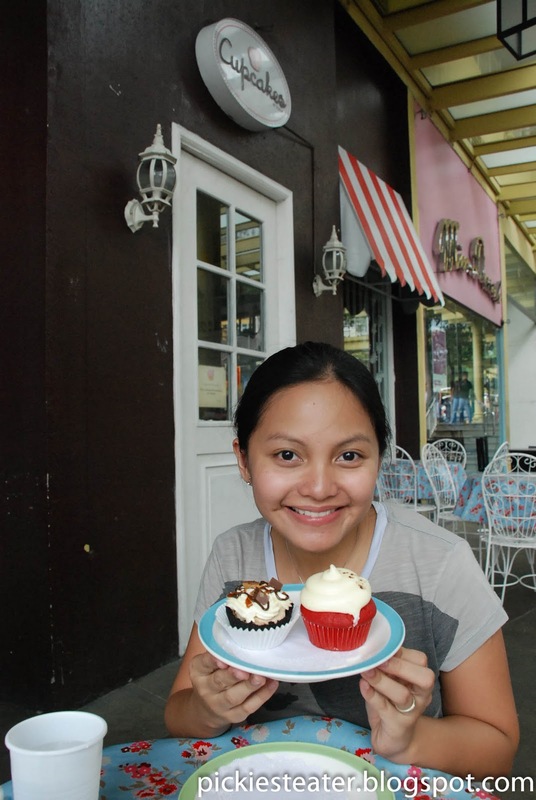 And everyone knows that Cupcakes by Sonja is perhaps the best place in the Manila for cupcakes (although, my lovely friend, KC isn't far behind - and that's on self study and sheer passion alone, mind you). After dropping by Krispy Kreme for some take out during day two of Schatzi's day out, Rina and I walked Schatzi to Serendra with the intent of heading straight to the basement parking where we had parked, and head off home. Alas, it was not meant to be. 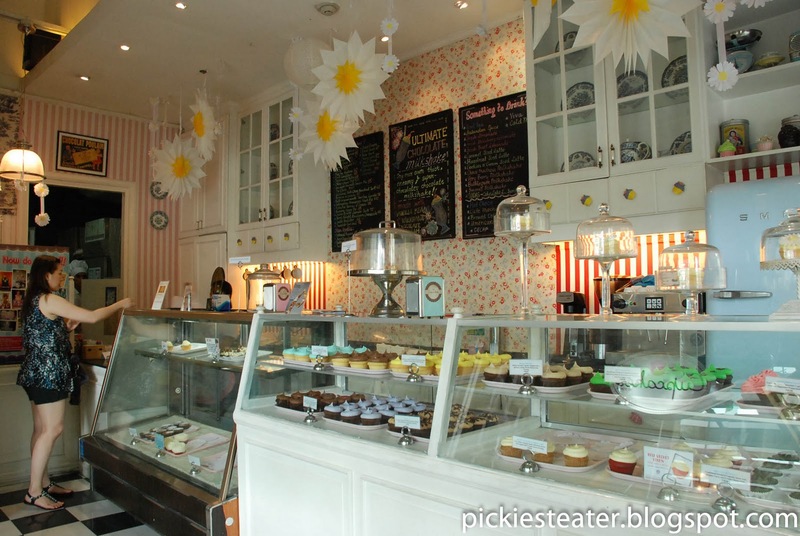 Once we saw the sign of Cupcakes By Sonja, a stopover was a must. Especially on breezy days, afternoons in Serendra can be really relaxing. And though there are tons of places in the area that offers other mouth watering desserts and other dishes, It's Sonja's, on the strength of it's cupcakes alone, that manages to stand out from the rest. Taking a cue from The King of Rock and Roll's famed fave, Fried Peanut Butter and Banana sandwiches, Cupcakes By Sonja creates their own version, but in the form of a Cupcake "Pie". 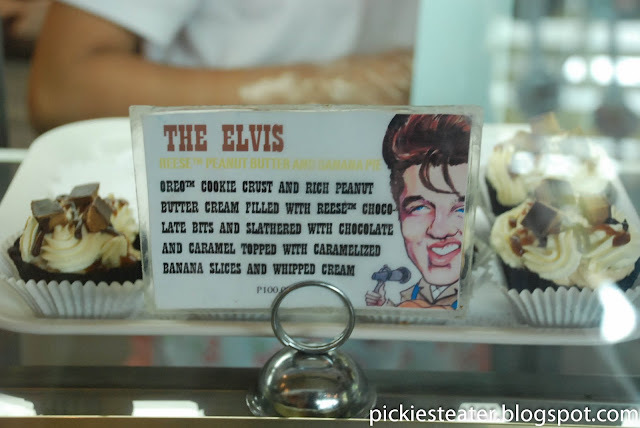 "The Elvis" is not so much a cupcake, but basically a mini pie, because it's got an oreo crust and everything. The moment I read the description, I knew I had to try it. Not just because I love Reese's Cups, but because any dessert that uses the word "slathered" in its description has got my vote. I ate that cupcake to save lives. 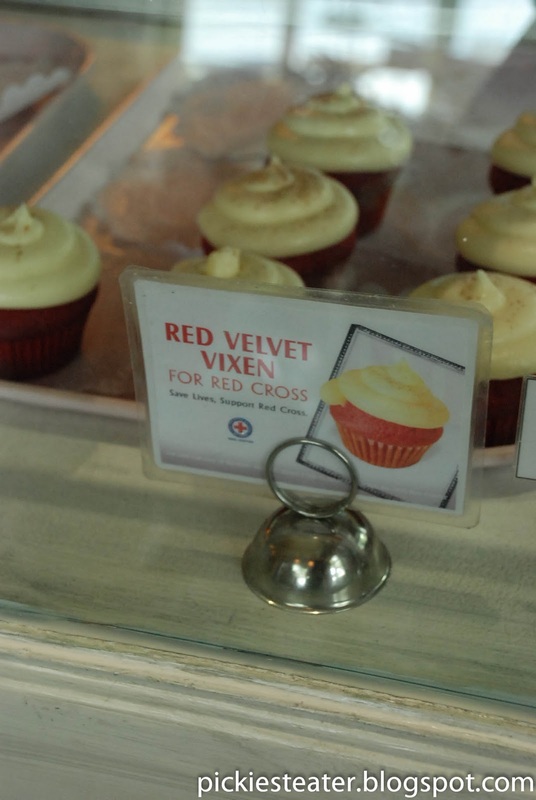 Rina saw the Red Cross sign in the Red Velvet Vixen (P70) and immediately knew what she wanted to order. I decided that since i've been guilty of the deadly sin of Gluttony quite a few times, I might as well do what I can to get my sentence lightened during my team here on Earth, right? The Red Velvet Vixen and a moist cake base that had the right amount of sweetness to go with its generous helping of cream cheese frosting. I'm still wondering what makes a red velvet cupcake "Red Velvet", I'm not complaining - it was really good. When I go to Sonja's I always get tunnel vision.. I can't seem to think straight and I don't know what to choose.. But the next time I go, I plan to try the Pistachio Berries and Cream, Valrhona Milk Choco-Hazelnut Tart, and the Berry Delight Strawberry Cheese Cake. Sounds good, don't it? 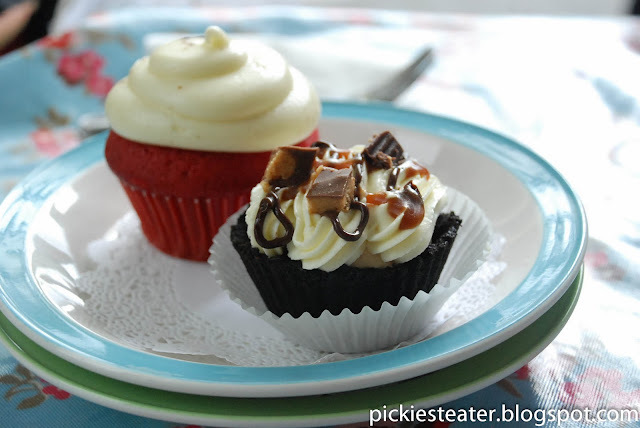 Though they are pricier than your average cupcake, The creations at Cupcakes by Sonja are anything but average. Creativity and size of their cupcakes alone makes it worth every cent you pay for. 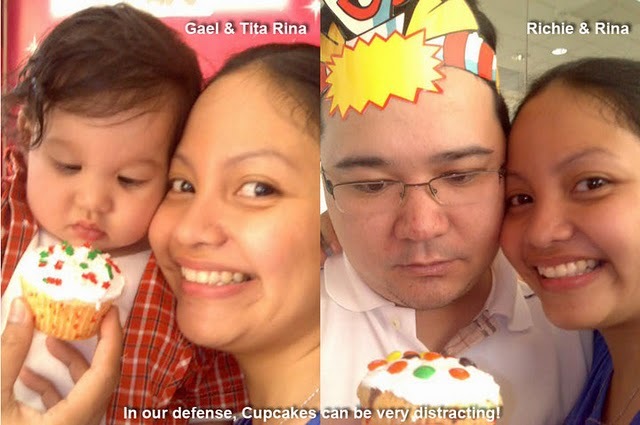 It seems that my love for cupcakes is a genetic thing, as evidenced by a test Rina implemented with me and my nephew, Gael, during a kids party we attended.